The Gyalwa Karmapa is the head of the Karma Kagyu lineage. 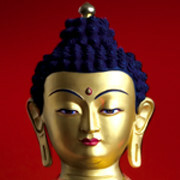 He is unique among the great lamas of Tibet, having reached full enlightenment centuries ago. During a previous incarnation, Karmapa was at the side of the historical Buddha as the great Bodhisattva Loving Eyes (tib. Chenrezig). From the year 1110, he became the first recognized incarnate lama of Tibet and continues to take successive conscious rebirths.